Greater Twin Cities Fuller Center will be a partner of the Millard Fuller Legacy Build with a local Greater Blessing Box project in Maple Grove, MN. The project entails replacing windows and siding along with new soffit and fascia. The home for a single mother of 3 teenage girls will be dedicated as part of a world wide effort to provide another 100 families with a decent place to live. The Fuller Center for Housing had been placed in our path long before the organization began, because many of us involved with Greater Twin Cities FCH have been touched in one way or another by Millard Fuller. Some of us have worked side by side with him as volunteers on projects here and abroad. Others have been deeply moved by one of his speeches or sermons, and we all felt impacted by God’s call to join the Fuller Center. 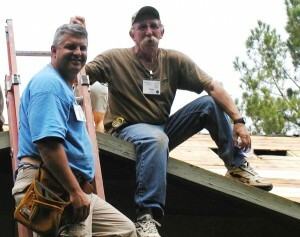 In 2007, our community participated in the construction of homes in Shreveport, La. without ever leaving Minnesota! Hundreds of volunteers gathered to construct frames for houses to be used in the blitz build in Shreveport, which built houses for victims of Hurricane Katrina. Since then, Minnesotans have continued to donate their time and resources to Fuller Center blitz builds. Our geographical service area is the Greater Twin Cities area. We are focusing on remodeling, using the Greater Blessings program, for the elderly, widowed, single-parent families, the disabled and the ill. Working in partnership with homeowner families, our mission is to restore, rehabilitate or construct decent, affordable housing for God’s people in need, transforming communities one family at a time and restoring pride in homeownership. The Greater Twin Cities Fuller Center is currently working to help restore the lives of the Prindle family by helping to rebuild their home that was destroyed during the Hugo tornado.